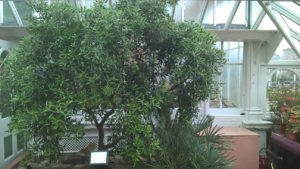 The olive is the most characteristic tree in the Mediterranean region. It is easily recognised by it’s beautiful silvery, evergreen leaves and superbly gnarled, dark brown trunks. Some trees are thought to be 2000 years old. After its flowers have been pollinated by the wind, the fruit matures; their colour changing from green to black. Raw olives from the tree taste horrible and have to be processed by soaking in oil, water, brine or even a strong alkaline solution to remove bitter chemicals. Archaeological evidence shows that the Olive was domesticated 10,000 years ago and has always been important for food, oil lamps, medicine, religion and culture. The main use today is for olive oil. Olives can be grown outdoors in the U.K, succeeding best in the hottest, sunniest place in the garden possible- a south facing wall is best. However copious water and a long hot summer is needed to produce fruit. Hardy down to between -7C and -10C, a cold winter would kill them, so they are best grown in a pot so that they can moved in a porch, cold greenhouse or conservatory if need be.